^ Berlinger, John Newsome; Berlinger, Joshua. John Glenn—astronaut, ex-senator—gets successful heart surgery. CNN (Atlanta: Turner Broadcasting System (Time Warner)). 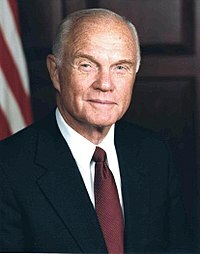 ^ Former astronaut John Glenn hospitalized in Columbus. Columbus Dispatch. 2016-12-08. ^ John Glenn Memorialized with 'Godspeed' Radio Hail Turned Hashtag. space.com. 2016年12月9日 [2016年12月19日]. ^ 'Godspeed, John Glenn'. Merriam-Webster. [2016年12月19日]. 拉皮达斯. 环绕地球飞行的首位美国人格伦. VOA. 2009-07-23 [2009-07-28].